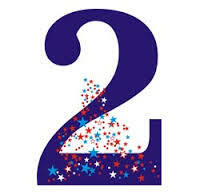 2 and 2: A great match of two souls both needing to give and receive love. Experts at mediation, they have little difficulty finding common ground on just about any issue that arises. The only word of caution for this pairing is that they must each remember how thin their own skin is so as to not cause verbal injury to the other. Generally this is not a problem because of their polite manner and mutual respect. 2 and 3: These are potentially very good partners because of the good humor and good chemistry. The 3 is always "on stage" and full of life and social energy, while the 2 is happy as a lark standing back and enjoying the show. The 2 balances the needs of the 3 by providing a soothing and calming influence. 2 and 4: This is a steady pairing resulting in comfort personified. When it comes to home and family, the 4 is the ultimate builder and provider. Security is 4's forte. Nothing is more appealing to the 2 than home, hearth, and family. The only difficulty likely here is one of perception. The 2 needs love to be shown and always physically apparent, and the 4 is sometimes not so demonstrative. 2 and 5: The 2 needs family and an ever present sense of being loved, and the 5 need total freedom to pursue whatever avenues appear on the horizon. This is one where the chemistry has to be very strong in order for the two very different souls to forge some significant compromises. Obviously, these two can provide a lot that may otherwise be missing, but it won't be an easy road. 2 and 6: This is another good love match. The 6 ranks first in family while the 2 tops the chart in love and caring. Still the pair need to watch their Ps and Qs as the 6 has a surprising need for approbation, and 2's thin skin can suffer with the direct and demanding approach that sometimes characterizes the 6. Considerations of feelings is a must. 2 and 7: This is a couple that has some strong and dissimilar needs. The 2's need for demonstrative love and 7's need for a good deal of space and solitude make this a pairing that will work only if both can stay tuned in to the other's needs and be willing to cater to them at least to some degree. Generally the 2 will have to find something to occupy much of the time that would otherwise be devoted to the mate. 2 and 8: A pairing that usually works very well because it is likely that each has a clear vision of their role. The 8 is about the outer world of business and attainment, taking care of the financial needs of the family. The 2 takes care of the family and is there to pamper the ego of their partner. A pitfall in this relationship can occur if the 8 fails to sufficiently value the labors of the 2. Generally, this is the classic traditional family model, or in the case of the male 2, female 8, the classic male/female role reversal.